Distimo is out with their monthly report on mobile app stores. 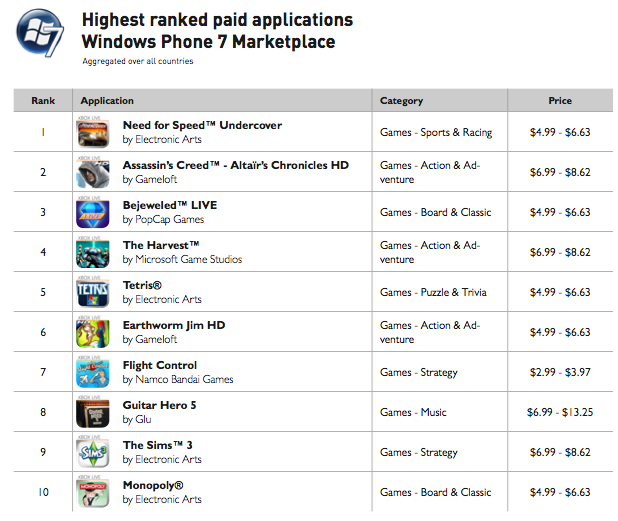 Included with the report are the highest ranked paid applications and it’s clear that games are currently ruling the Windows Phone 7 Marketplace. Games are priced higher than competitive platforms, but that hasn’t slowed their sales. Flight Control for Windows Phone 7 was priced in the range of $2.99 – $3.97 compared to $0.79 – $1.46 on iPhone. Is it the lack of competition or are developers raising prices to due to lack of volume? Either way, let’s hope these prices drop in the coming weeks and months.